Drugs that treat a form of vision loss known as age related macular degeneration aren’t just big business. They’re also a controversial part of the national debate over high drug prices, and their increased use has put ophthalmologists in the crosshairs of insurers, the federal government, and the press. The spotlight could soon grow brighter. By the end of the year, New York drugmaker Ophthotech (NASDAQ: OPHT) will release Phase 3 data for pegpleranib (Fovista) that could change how age related macular degeneration (AMD) is treated. Should pegpleranib produce positive results—by no means a guarantee—it could soon become the first combination treatment for the more damaging form of the disease, known as wet AMD, adding another flashpoint to the debate over drug prices. Today, wet AMD patients periodically get a single drug injected into their eye. Pegpleranib would either be a second, separate injection, or be mixed with another drug into a single injection. If pegpleranib were to work, it could give ophthalmologists another weapon to use against wet AMD. Yet eye doctors interviewed by Xconomy were on edge about the pending results and their effect on costs. In 2014, for the first time ever, the Centers for Medicare and Medicaid Services, which administers the federal Medicare insurance program, published data showing how much reimbursement individual providers received. Ophthalmologists topped the list, accounting for $5.6 billion, or 7 percent, of all Medicare money in 2012, according to the New York Times. The substantial reimbursements were driven in large part by the doctors’ prescriptions of drugs for wet AMD. The condition causes a distortion of vision—imagine a grey or black marble in the center of your vision that expands over time without treatment. 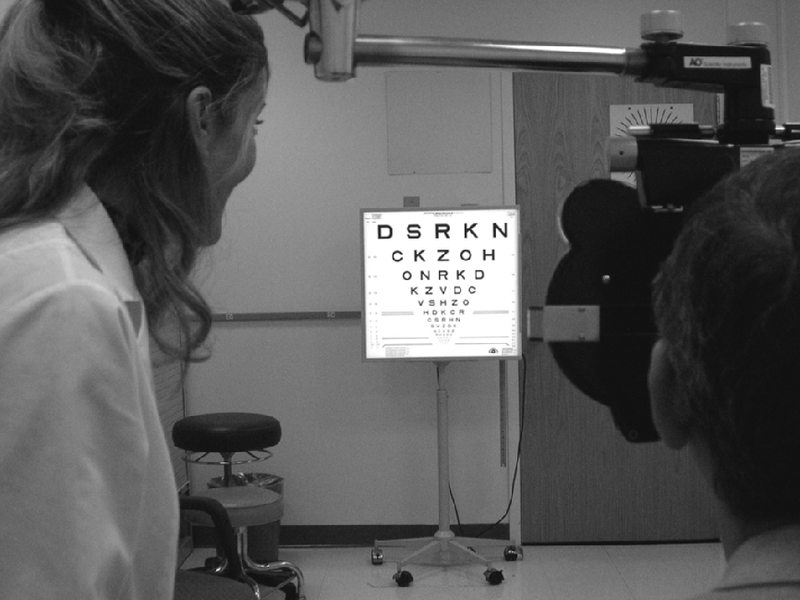 A scene as it might be viewed by a person with age-related macular degeneration. Photo courtesy of the National Eye Institute. AMD affects more that 2 million Americans, a number expected to grow to nearly 5.5 million by 2050 as the population ages, according to the National Eye Institute. Between 85 and 90 percent of have the slowly progressing “dry” form, for which there are no approved treatments. The remaining 10 to 15 percent have the fast-moving wet form, when abnormal blood vessels form in the eye and leak fluid, ultimately causing potentially significant vision loss. The market for AMD treatments has exploded the past several years. Until recently, the standard of care was laser therapies that didn’t actually improve patients’ vision. They stopped deterioration but as a consequence destroyed the very retinal tissue clinicians were trying to save. But the standard has evolved to injectable pharmaceuticals that improve patients’ vision without damaging their eyes. Ranibizumab (Lucentis) from Roche/Genentech and aflibercept (Eylea) from Regeneron Pharmaceuticals (NASDAQ: REGN) are the only two FDA-approved drugs for wet AMD. Each costs doctors close to $2,000 a dose (how much of that cost is passed through to patients can vary), and they generate more than $7 billion in annual worldwide sales combined. The amount the U.S. Medicare system spends on these two drugs alone is significant. Medicare spent about $2.63 billion combined on aflibercept ($1.3 billion) and ranibizumab ($1.33 billion) in 2014. That’s roughly 12 percent of the $21.5 billion it spent on its so-called Part B program, which governs drugs administered in hospitals and clinics. Spending on those two drugs alone rose eight percent from the previous year. These wet AMD drugs aren’t cures, but they can restore some vision, prevent further damage to the eyes, and stop people from going blind. They block a protein called VEGF and stop abnormal blood vessels from forming. A patient’s improvement depends on how much damage the eye has already suffered from the leaking fluid. Patients receive injections once a month or less, depending on the severity of their case and how well they respond to treatment. Some might need monthly injections for a short time, and others might stay on repeated injections for years. Every patient is different. “If you ask 100 retina specialists, you may get 100 different answers” for how to treat them, says Jonathan Feistmann, who co-owns NYC Retina with Shulman. There is a much cheaper alternative. Bevacizumab, also from Roche/Genentech, was the first injectible anti-VEGF drug used to treat patients with wet AMD. It isn’t FDA approved for that use, but is widely prescribed off-label and costs closer to $50 a dose.